We have had so many emails and feedback on our Star Wars food ideas that we made awhile back so we thought that we would go ahead and make it easier for everyone to see all of them in one post. 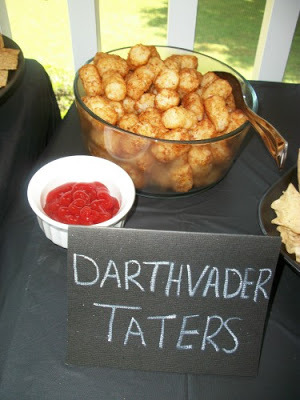 My 5 year old has become a Star Wars fanatic so I am sure we will be making a lot more fun Star Wars food in the near future! My now 5 year old has never wanted just a normal cake. However, that is just fine. I love how he can think outside of the box! He did have some help from his Uncle Brian thinking up this one and I was fine with how easy it would be. The Garbage Masher happens to be his favorite scene from Star Wars so we tried to come as close to it as possible. It’s definitely original! 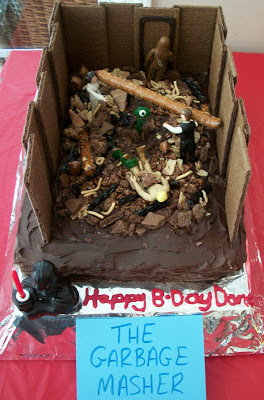 The big Star Wars fans really appreciated this cake and just thought it was awesome! We used chocolate cake, chocolate frosting, chocolate cookie icing, chocolate graham crackers, broken up misc. candy and cookies, large pretzels, 1 green fruit roll up, 1 edible eye ball, and Star Wars figures. We made our walls with the chocolate graham crackers. We glued each of them together with the cookie icing over lapping them. We set them aside to dry. We made our chocolate cake in the 9×13 pan. We used parchment paper on the bottom for easy release. We needed the cake just a little large for the walls to fit so we broke off 3 small pieces of the graham crackers and stacked those around the whole cake. Worked out great! Then we frosted the whole thing with our chocolate frosting. We broke up different pieces of cookies and candy that we had around the kitchen and scattered them around the cake. We used black twizzlers, graham crackers, chocolate chips, large pretzels, Star Crunch cookies, etc… We then arranged our washed and cleaned figures to the cake. Leia and Han Solo are holding a large pretzel stick for the pole that was used in the scene. We then placed our graham cracker walls around the sides. We placed Chewbacca at the door and Luke being pulled under by the creature. For the creature we covered half of a pretzel stick with a green fruit roll up. We attached a green jelly bean for his head and our edible eye ball on the jelly bean. We used the rest of the fruit roll up for the creatures leg that is pulling Luke under. If we had more time we would have covered Han Solo and Luke in white fondant to look like they were wearing Storm Trooper outfits like the scene, but we ran out time! This was a pretty easy and fun cake to make!! My little Star Wars birthday boy was very pleased!! 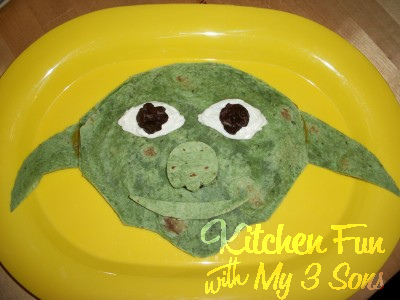 This Yoda quesadilla was just something fun we did last week unrelated to his party. I had some spinach tortillas and thought something like this would get the boys to try it out. My soon to be 5 year old always tends to run at the sight of green…however, this quesayoda did the trick in getting him to try it and actually like it! We used 2 spinach tortillas, cheese, black beans, and sour cream. Just cut a yoda shaped head out of the tortilla. We used the scraps to make the ears. Put the cheese inside and either fry it up on the stove or microwave it for 30 seconds or so. Let it cool just a bit. Put on the sour cream for the eyes and the black beans for the pupils. We also used scraps to make the nose. 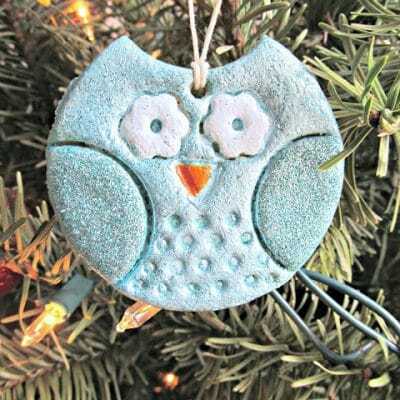 Super easy and so much fun for the kids! 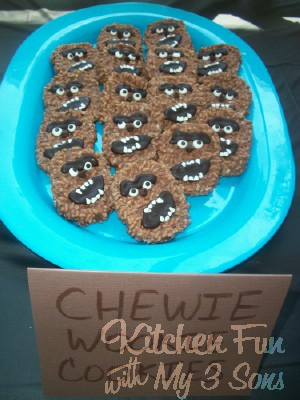 We made these Chewbacca cookies for my sons Stars Wars b-day party. 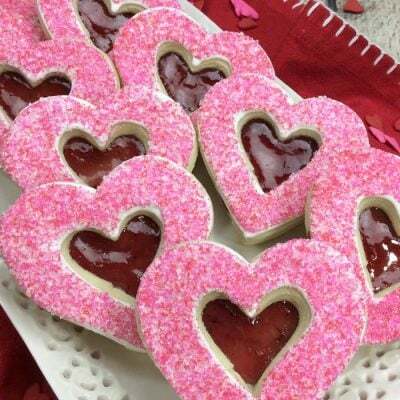 We used Little Debbie Star Crunch cookies, cookie frosting, mini chocolate chips, edible eye balls, and mini heart candies. We decided to use the Star Crunch cookies because we thought that the crisp rice in the cookie would look like hair and well…they are chewy!. They are round so we shaped them into more of a square. We added our chocolate cookie frosting for the mouth and to attach our edible eyes. 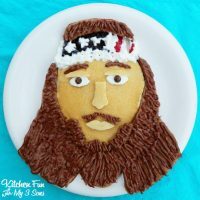 We piped more frosting over the top of the eyes. We attached our mini chocolate chip for the nose. We broke mini heart candies in half for the teeth. Pointed side down for the fangs and the rest on the rounded side. 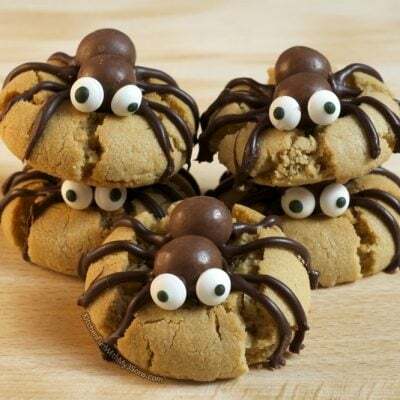 The kids loved them…and our Wookiee Cookies were gone in a flash! 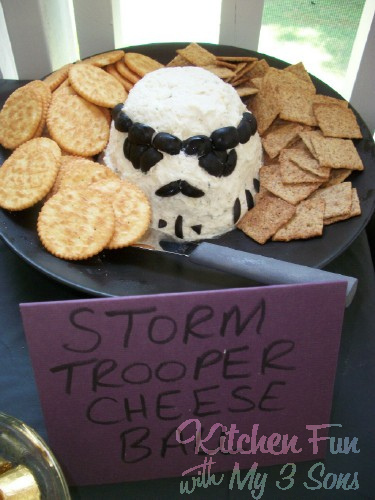 Here is the Storm Trooper cheese ball. We used 2 packages of cream cheese, 1 packet of Ranch dressing mix, 2 cups of monterey jack shredded cheese, and black olives. Mix everything together besides the olives. 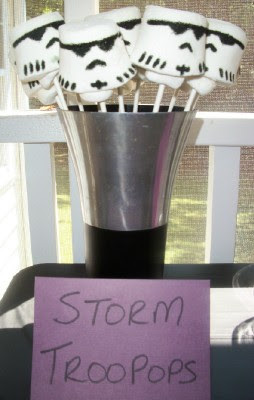 Shape the ball into a Storm Trooper head. Slice up the olives for the face and other details. This cheese ball was actually very good! 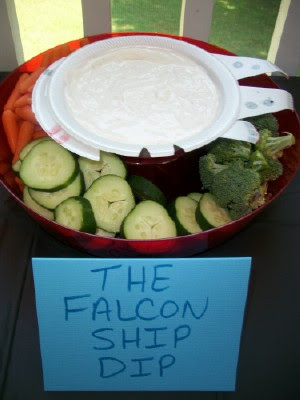 The Falcon Ship Dip! We just took 2 styrofoam bowls and cut one of them out to make the ship. We had to have something healthy and this is all we could come up with for veggies. 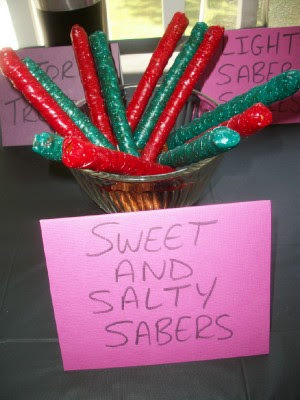 We made sweet and salty sabers with large pretzel sticks and fruit roll ups. 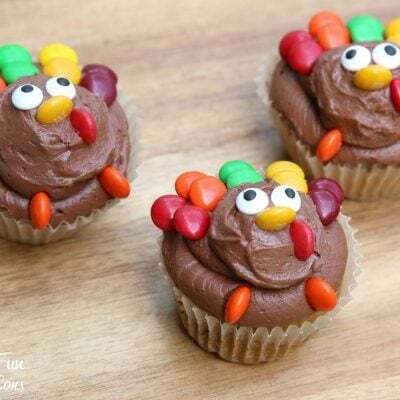 These were so easy and the kids loved them! 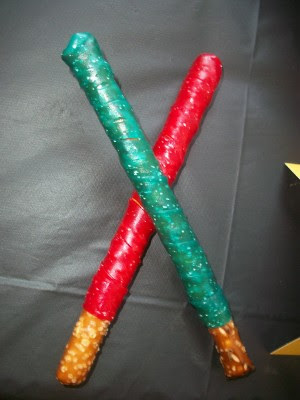 Just wrap up the pretzel stick with the roll up leaving some of the pretzel sticking out at the bottom. We made Jar Jar Binks in a blanket. These are always a hit at kids parties and we thought the name was cute. We used turkey dogs and croissant rolls. Darth Vader Taters. Another easy dish and well…kids like tater tots! 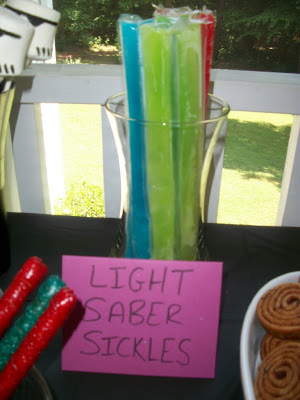 Light Saber Sickles. We thought this would be fun to stick out last minute. We just took different colored popsicles and put them in a bowl. 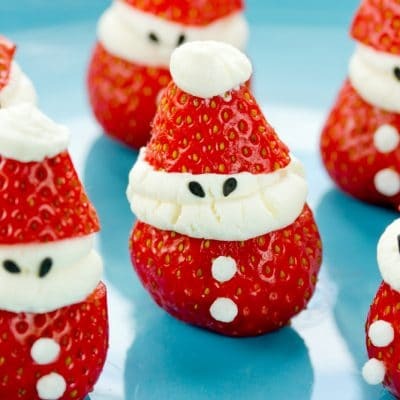 Of course we put them out later so they would not melt. One of the party tables and the birthday boy! We made a giant Darth Vader out of boxes and trash bags. 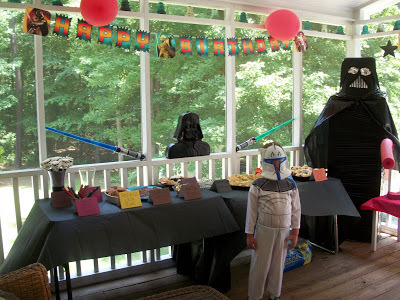 We used one of those pool toys for his saber.ha Another thing that we did was blow up long balloons (the ones people make animals out of) and wrap foil on the bottom for the kids to have their own sabers. Plus…no one gets hurt! They loved them! Forgot to take a picture with all of the craziness of the party. My Troopers and our little Darth Vader. Such a fun party! 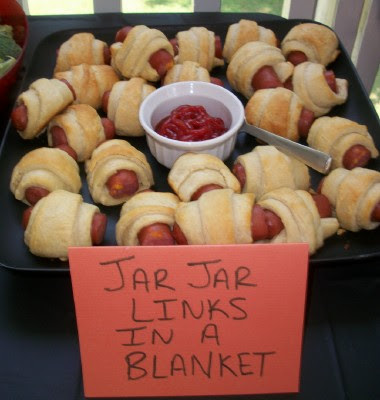 We tried to think up original ideas and hope that you can use some of them for your next Star Wars party! Next Post » Football Burger Dinner! 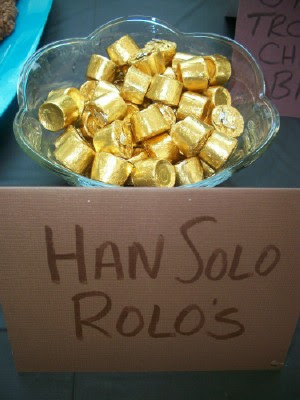 I am pinning this for all my Star Wars loving friends. 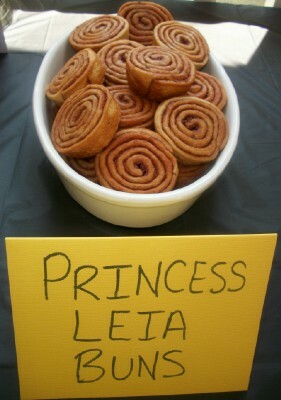 You are the queen of fun food! Awesome! Thanks for the complement! what a cool bunch of stuff. I really like the garbage masher cake and the stormtrooper marshmallows. Oh my gosh. You have to be the coolest mom ever. I have two boys who would think this is awesome! Very creative! Did you put the tootsie rolls in the microwave for 8 seconds or 8 minutes? I am guessing that you meant to put seconds because 8minutes would be too long. 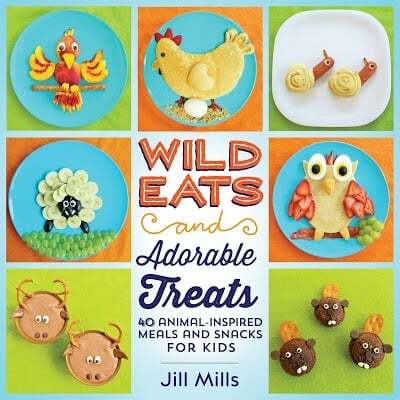 Thank you for sharing these fun food ideas! I am excited to try them out with my boys! Thanks for pointing that out! Yes…8 seconds. I would hate to see what happened to a tootsie roll in the microwave after 8 minutes!! Wookiee is spelled with two Es. 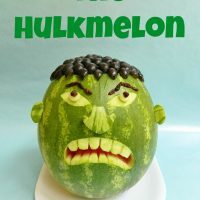 Awesome food, though, very creative!!! I am so glad I found this! My boyfriend is obsessed and his birthday is coming up! Becky…you can get them both at walmart. Wow! 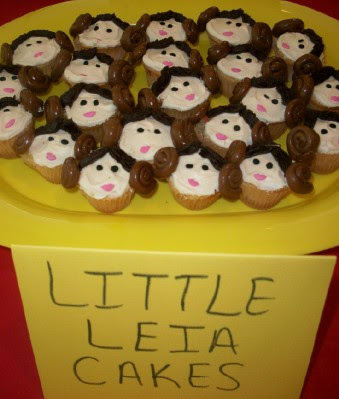 Great ideas for a star war birthday fanatic! Good job! 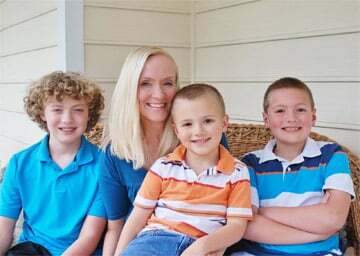 U are one amazing mum! Could you tell me how u got the turkey dogs in the crosiants? Do u then heat as one in oven? You. are. a genius!!!! My son and I just had a giggle-fest just from reading the names of these snacks. Thanks for sharing all the ideas! 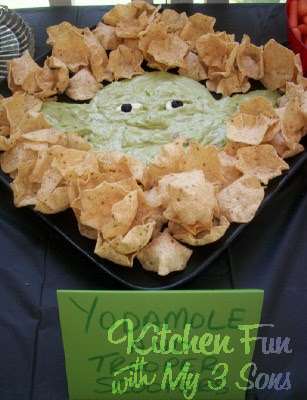 How did you make the guacamole into the shape of Yoda's head? 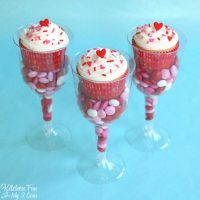 I am SO bookmarking this for hubby's birthday. 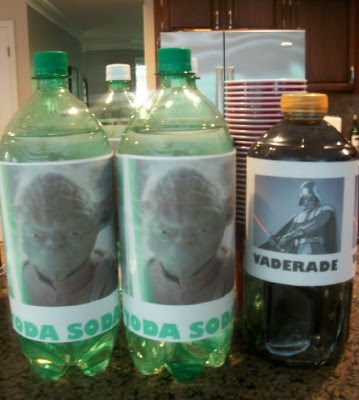 He is a huge Star Wars fan, and this would make him one happy man! 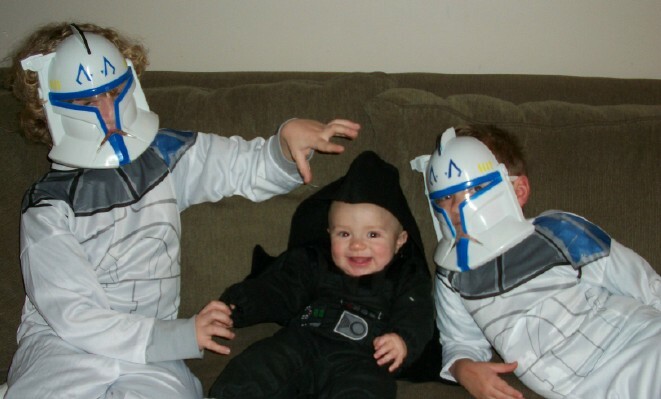 (Proof that there is no age limit in either direction when it comes to Star Wars).